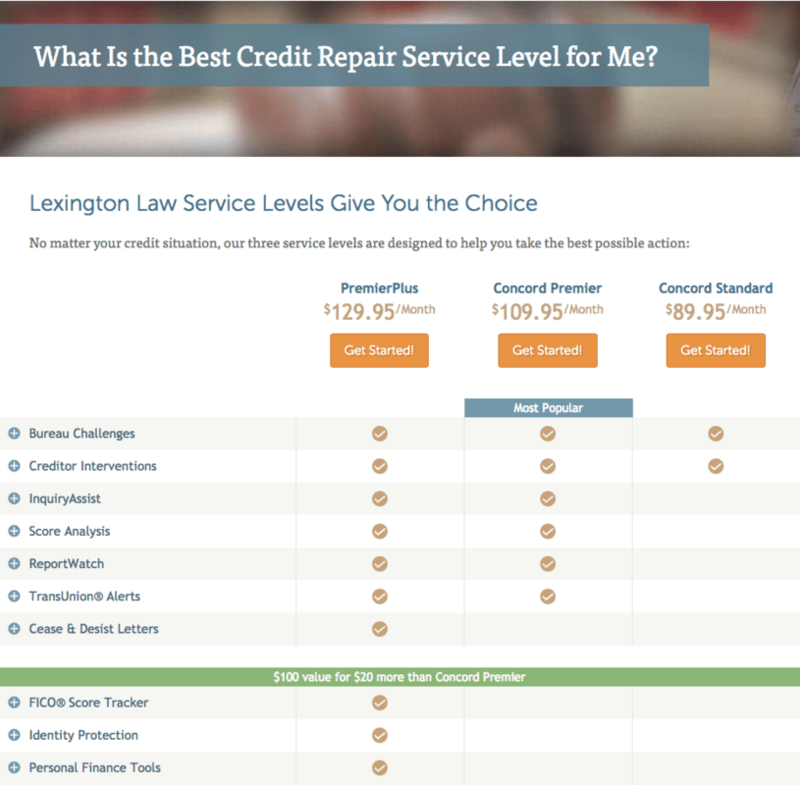 Lexington Law Review: Are They a Legitimate Credit Repair Company? This is a sponsored post with Lexington Law. All opinions are 100% our own. If you are looking for a credit repair company, you should hire a company that delivers real results in the shortest time possible. Finding such a company can be a daunting task since there are so many fake credit repair companies out there that are just after your money. That’s why we put together this in-depth review of one of our favorite credit repair companies, Lexington Law. By the end of reading this, you should have a great understanding of who Lexington Law is, what they stand for, the services they provide, how they can help you, pricing, and more. If you are searching for a credit repair company to help you improve your negative credit score—check out Lexington Law. 1) Lexington Law has many years of experience! 2) Does Lexington Law have good customer service? 3) Lexington Law meets the (FCRA) Fair Credit Reporting Act. 4) Can Lexington Law solve all of my credit problems? What is your current credit score rating? Lexington Law has been in business for over a decade. This law firm has helped hundreds of thousands of customers to take action in repairing their credit score. Their many years of experience is one aspect that sets them apart from other credit repair companies. Lexington Law is a leading credit repair company that has delivered excellent results for their customers. This law firm has gained dominance in the field of credit repair due to their good reputation working with their clients to help raise and repair their credit scores. Also, the fact that Lexington Law is both a law firm and a credit repair company gives it a competitive edge against the others. Having withstood the test of time since its inception, this credit repair company and a law firm has gained an incredible reputation among many clients who have sought their services. Of course! Helping their clients understand and take action against inaccurate, unfair, or unsubstantiated credit report items is Lexington Law’s passion. The moment you purchase one of their credit repair packages a dedicated and proficient legal team is assigned to your case. The team will have an open line of communication giving you updates on the progress of your case. Additionally, Lexington Law goes the extra mile of actually educating their clients about credit repair through articles, videos, and eBooks. They want to make sure after a client’s credit score is repaired they have the knowledge and understanding to continue to monitor and increase their scores over time. Before you decide to hire any credit repair company, you need to first review its compliance with federal laws. Going through this process you will quickly find that Lexington Law follows ALL laws and regulations in their practice. Something many shady credit repair companies fail to do. I personally found Lexington to be very upfront and honest about meeting the FCRA standards and providing the best service around. This law firm clearly educates you as a client about your rights. They hide nothing from their customers regarding the agreement. Lexington Law does not promise results from their services. Lexington Law firm doesn’t make impossible suggestions like creating a new identity as a solution to your negative credit scores. Depending on your needs Lexington Law will have you covered with their many credit repair services. Lexington Law has managed to serve hundreds of thousands of customers from the time it was founded, something that really struck me. While other companies were getting closed by the government, Lexington Law continued to grow bigger and better. Let the customer reviews below speak for themselves. There is nothing more disappointing than hiring a credit repair company that has no clear way in which you can inquire about the progress of your credit repair. Seriously imagine how frustrating that would be! One thing I like about Lexington Law is the manner in which they have set up their communication line with the clients. Even better, they have an easy to navigate website that you can log in at any time. So, checking on the progress of your credit repair is as simple as a click of a button. I really liked the fact that Lexington Law offers different service packages based on your needs. When it comes to credit repair a one size fits all service package can be frustrating. Lexington Law offers three unique packages so you can easily find one that fits your needs. Please note that Lexington Law does have a one-time setup fee not included in the pricing below. This package goes at $89.95 per month. It is their basic service package. This package is designed to clean up your negative credit report. They do this by getting in touch with your creditors and credit bureaus in order to resolve your negative credit score marks and history. This is the intermediate pricing program. In this program, Lexington’s paralegal team, your creditors and credit bureaus are involved in the removal of your negative credit scores and history. In this package, Lexington Law employs its legal expertise to argue the Fair Credit Billing Act, Fair Debt Collection Practices Act, and Trust in Lending Act. This is their highest priced program. In this package, you will get to enjoy identity theft protection, credit score monitoring, and other services in order to control and manage your finances in the future. In my honest opinion, if you are looking for a legitimate credit repair company that has been in business for many years with a positive track record then Lexington Law is your answer. Lexington Law has proven over and over that they are a credit repair company you can comfortably trust to help repair your credit score. Head over to Lexington Law now to learn more and get started in repairing your credit score once and for all!